A Jason Crabb "Crabby" Caption contest, Ken Davis on the silver screen, Alaskan Cruise information and more! 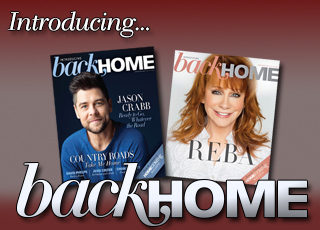 (NOVEMBER 2012) Please give us your feedback about Homecoming Magazine! Is there an article that has touched your heart? Which section do you turn to first, and why? (DECEMBER 2012) Homecoming Magazine recently asked Jim and Melissa Brady to share their favorite thoughts and memories about Christmas, and their answers are inspiring! Be a part of Homecoming Magazine ... submit photos, letters, creative works and more! Gerald Crabb wins BMI award; Jean Burger passes away; Cathedrals reunion and SocialCam videos featuring Jeff & Sheri Easter, the Booth Brothers with Gene McDonald, the Isaacs and Kelly Nelon Clark's "talking" dog Sam. Over the years, Bill and Gloria have enjoyed interviewing musicians, authors, actors, sports figures and even heads of state! What person would you like to see them interview next? (MARCH 2014) Tell us about a veteran you would like to honor. (MAY 2014) Gaither Homecoming fans share real-life stories of hilarious things they've heard children say. Crabb Family announcement, prayers for Libbi Perry Stuffle and Tim Riley, David Phelps' daughters launch a website and more! Karen Peck interview, the passing of a Homecoming artist, Dove Awards pics and more! Joseph Habedank comes clean, Homecoming's Picture Perfect contest, Chonda learns to laugh again and more! Mark Lowry's latest, changes for Ernie Haase & Signature Sound, Canton Junction singer welcomes new baby and more!